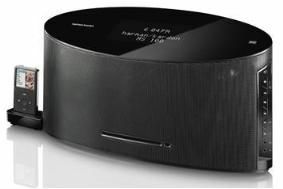 Harman Kardon introduces £500 MS 100 audio system | What Hi-Fi? Spot any similarities? Both models have a remarkably similar shape, although in the case of the Harman Kardon your iPod sits in a pull-out dock at the side of the unit, rather than on the top like the B&W. The MS 100 also has a built-in CD player and FM tuner with RDS. It has a "sculptured, minimalist appearance", says HK, and is finished in high-gloss black with subtle white illumination for the display. The dock is compatible with most iPods from the G4 series onwards (but not the Shuffle), and when docked wil charge your iPod and enable it to be operated uisng the MS 100's remote control. Connectivity includes S-Video and composite video outputs for viewing your photos and videos on a TV. The slot-loaded CD player can play CD, CD-R and CD-RW discs as well as MP3 and WMA files. There are six station presets for the FM tuner, which also has RDS text display. Sound is handled by a pair of 5in woofers and two dome tweeters powered by the built-in amplifier. Additional features include an alarm clock, three auxiliary audio inputs (including a digital input), a headphone jack and subwoofer output. Harman Kardon's MS100 goes on sale in the UK this week.